My kids were on winter break this past week so we took a quick trip to Bradenton, Florida to visit my parents. Within 10 minutes of getting there the kids started asking to go to the beach. Even though it wasn't super warm out and kind of windy, we headed out. The next day we headed to St. Armands Circle in Sarasota for lunch. The water was so beautiful along the way we had to make a pit stop to take some pictures. Hmmmm. Not sure what to say about this. Anyway, we made one last trip to the beach. It was sunny and beautiful. Ahhhh. I miss you beach. Back to reality. Glad spring break is only a 32 days away! Being on the 17 Day Diet hasn't been easy for two reasons. One, I love sweets! Two, I love food in general. I have been dying for something sweet and nothing was working to curb that craving. That is until now. I can't believe how good this tastes and how healthy it is at the same time. It tastes like apple pie. That is without the sugar, butter and crust. Okay, it doesn't exactly taste like apple pie but close enough and I can eat it everyday. 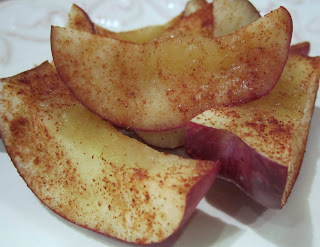 All you do is take an apple (I used Red Delicious), slice it, sprinkle with cinnamon and microwave for 1 1/2 - 2 minutes. I like mine mushy so I nuked the heck out of it. Not only is the apple good for you but cinnamon has great health benefits of reducing fasting blood glucose, triglycerides, LDL cholesterol and total cholesterol. Gonna love it! 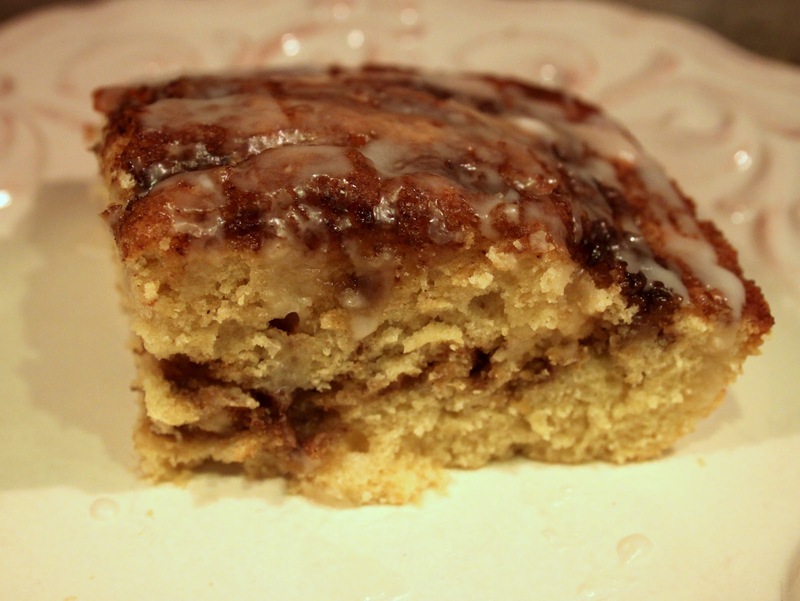 This might be called coffee cake but it's like having dessert for breakfast. It's kind of like cinnamon roll meets cake. How can you go wrong with those two? If you want to cut back on the sugar just serve without the frosting. It is delicious with or without. If you're like me and are not awake until you have downed two coffees, this is even better because you put it together the night before and bake in the morning. Bonus! Begin by combining the 1/4 C butter, 1/4 C applesauce and 1 1/4 C sugar in a large bowl. Stir until well mixed. Next, add the 3 eggs and 1/2 tsp. vanilla and mix well. In a second bowl, combine the 3 C flour, 1 tsp. salt and 2 tsp. baking powder. Add the dry ingredients to the wet ingredients, alternating with the addition of 1 C milk. Stir until well mixed. Spread half of the batter into a well-greased 9x13 glass baking dish. In a small bowl, combine the 3/4 C brown sugar and 1 tsp. cinnamon. If interested, add 2 T melted butter to the mix. I omit the butter here. Sprinkle half of the filling over the batter in the baking dish. Then, carefully pour the remaining batter over the filling. Sprinkle the remaining cinnamon sugar mixture over the top of the cake. Cover and refrigerate overnight. When you remove the cake from the oven, mix together the 3/4 C powdered sugar, 1 T hot water and 1/2 tsp. vanilla. Drizzle over the cake as you serve it. Diet is truly a four letter word. I have been on the 17 Day Diet for 8 days, 16 hours and 32 minutes but who is counting. I really shouldn't complain because I have already lost 6 and a half pounds! During the first 17 days or Cycle 1 you are allowed to eat lean protein and salmon is on the list. I have never made salmon and thought I didn't care for it. After eating chicken for a few days I decided to give it a try. But how? I did what I normally do when I need to know how to do something. I Googled it. Bunch of different ways to do this but this one is sooooo easy and turned out perfectly yummy. All you have to do is place the salmon on a baking pan, drizzle with a little olive oil (allowed on diet), and season with salt and pepper. Place it in a COLD oven and then set to 400 degrees. If you are baking one big piece (1+ lb) it will take about 30 minutes. When I baked two individual pieces it took almost 25 minutes. It will flake easily with a fork when it is done. How easy was that? Guess this 17 Day Diet isn't so bad after all. These are my parents! Aren't they cute? Can you believe my Mom is 69 and my Dad is 70? No that isn't a typo they are 69 and 70! They don't hesistate to tell anyone their age. Why would they? They look great! Happy Birthday Mom! I love you!